Deloitte is one of the largest providers of professional financial services in the world; one of the “Big Four” accounting firms. In 2014, Deloitte’s Center for Corporate Governance published the ninth edition of their Board Best Practices Report. The report surveyed board members across multiple industries to provide a glimpse into the makeup and priorities of the modern board of directors. The tenth edition of the Board Best Practices Report was published in 2016. The surveys conducted in both the ninth and tenth editions are nearly identical. While both editions offer valuable insights, governance aficionados have yet to explore all that can be learned from comparing the two. Today, we’re changing that. Because of the enormous amount of information covered in each report, we wanted to focus in on one industry and a few question categories to examine. The financial services industry was a key target of both the 2014 and 2016 reports. Directorpoint’s board management software has helped bank boards make better decisions for years, so choosing an industry was easy. For question categories, we decided to focus on what the modern bank board looks like (their “composition”) and what they value (their “priorities”). Once we found our targets, we be dove deep into the data for a better understanding of where bank boards were, where they are, and where they’re going to be with a new decade on the horizon. Here’s what we found. The average size of bank boards hasn’t changed much between 2014 and 2016. Boards within the financial services industry are most commonly comprised of nine to eleven members. However, bank boards are growing. In 2014, 53% of directors listed the board of their financial services institutions as having more than ten members. In 2016, 65% of financial services boards reported having more than ten members; a 12% increase. This growth isn’t earth-shattering, but it’s concerning nonetheless. If we’ve learned anything from Jeff Bezos and Amazon’s Two-Pizza Rule, it’s that the effectiveness of a group decreases as its size increases. If bank boards continue this trend of growth, we would expect to see a shift in their priorities towards training directors and equipping them with the necessary tools and resources for maximizing their decision-making effectiveness. 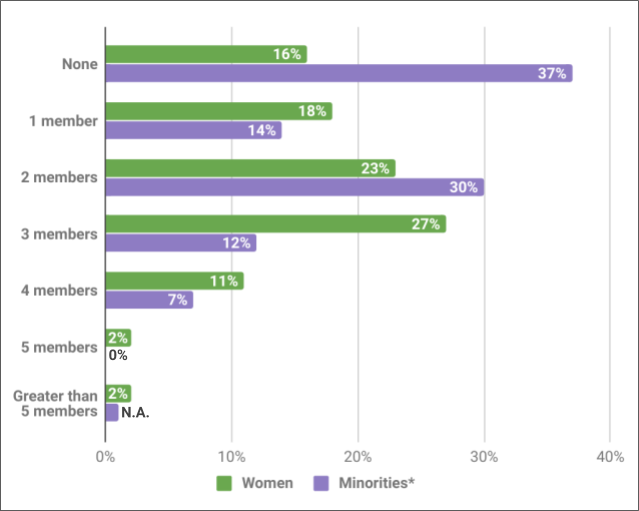 The 2014 survey asked board members “what percentage of board members are women/minorities”. The 2014 results were compared to responses given in 2012. This data suggests that bank boards fall roughly into alignment with the trends we’ve already observed regarding women’s representation in the boardroom. That is to say, slow steady growth from a starting point reflective of the “Mad Men” era. According to a study from the Credit Suisse Research Institute, the number of women on boards increased 54% from 2010 to 2015, bringing the total percentage of directorships occupied by women up to an underwhelming 14.7%. Ethnic and racial minority representation on boards has grown at a similar rate in recent years. Institutional Shareholder Services found that, in 2017, minorities held 10.6% of directorships within in the S&P1500; a ten-year high. 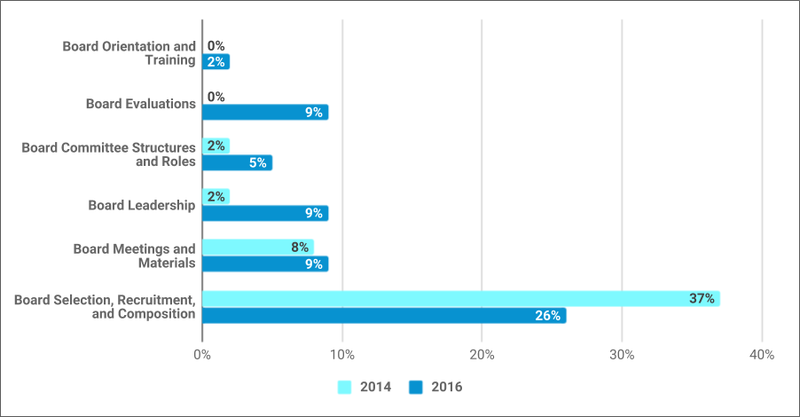 As we said upfront, the survey distributed in 2014 was nearly identical to the survey distributed in 2016. However, the 2016 survey introduced a slight variation which proved to be both telling and concerning. Instead of gauging boardroom representation with a percentile range, directors were asked to select the specific number of women and ethnic or racial minorities on their boards. To recap the findings above, 34% of boards surveyed within the financial services industry had one female board member or less. A staggering 51% of financial services boards had one or less director with a diverse racial or ethnic background. Again, these were the results from the 2016 survey. These findings indicate that boards within the financial services industry, could be doing much more to diversify their compositions. Heterogeneity in the boardroom feeds bias and groupthink. Beyond that, a lack of diversity can handicap a board’s ability to identify bias in the first place. Making the commitment to emphasize diversity and inclusion when recruiting directors is an easy way for bank boards to increase the effectiveness of their decision-making. 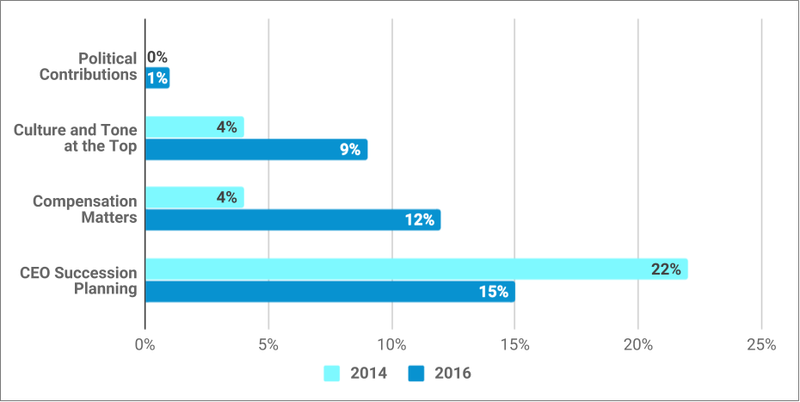 The last question on both the 2014 and 2016 surveys was a multiple choice selection of board members’ top three priorities for the coming year. The percentages listed refer to the number of directors within the financial services industry who selected a given topic as being among their top priorities. It’s not surprising that sustainability was not a priority for boards within the financial services industry. It was not listed in the top three of any board member in the 2014 survey and was not included on the 2016 survey. Regardless of a board’s commitment to sustainability, it’s not something we’d expect to see being in its top three priorities. Prioritization of “Technology and Data Analytics” and “Cybersecurity” increased 4% and 14% respectively between 2014 and 2016. It’s worth noting the 10% difference between these two increases. To some extent, “cybersecurity” is a buzzword. It’s something everyone’s heard is important regardless of whether or not they know why. However, cybersecurity does present a legitimate threat to bank boards. A security breach can mean compromising depositors’ PII data. Not only does this significantly increase the risk of fraud, it can lead to costly damages in a bank’s brand and reputation. While we’re glad to see the prioritization of “Technology and Data Analytics” on the rise, it’s concerning to see that it was only selected among the top three priorities of 14% of board members. Given the prioritization of cybersecurity (24%) and risk oversight (56%), we would expect to see Technology and Data Analytics at anywhere between 30-45%. It’s all but impossible to prioritize cybersecurity and risk oversight without also emphasizing data and technology. That’s the takeaway for bank boards, here. We’re hoping the underwhelming increase in the prioritization of “Technology and Data Analytics” can be chalked up to the topic having a fairly broad scope. A decrease in the prioritization of “Risk Oversight” is concerning, but not surprising. It’s been over ten years since the Great Recession of 2008. The economy, while worryingly volatile in recent months, has largely thrived. However, the only reason bank boards should direct focus away from risk oversight is if that focus is reallocated to “Technology and Data Analytics” or “Cybersecurity” (as both play a significant role in risk mitigation). The shift in prioritization between 2014 and 2016 would suggest this may be the case. The 5% decrease in “Risk Oversight” is accompanied by 4% and 14% increases in “Technology and Data Analytics” and “Cybersecurity” respectively. When evaluating your board’s priorities in the coming year, consider balancing out any decrease in “Risk Oversight” with an increased emphasis on “Technology and Data Analytics” or “Cybersecurity”. While “Crisis Preparedness” was not listed as an option in the 2014 survey, the fact that it only made it into the top three priorities for 3% of board members is alarming. 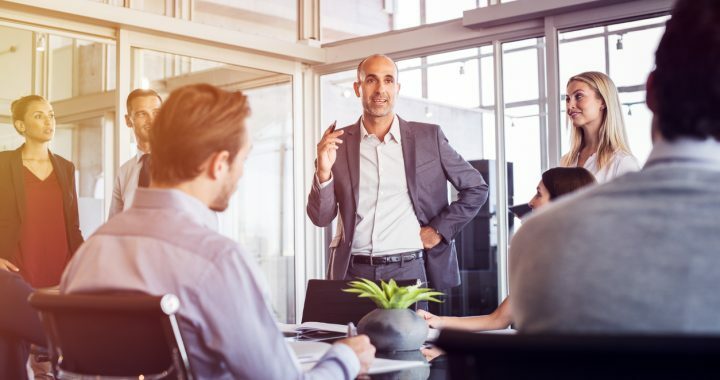 The only reason to let crisis preparedness slip from your board’s priorities is if you’ve already implemented overly-thorough and regularly-maintained preparedness measures. While none of the topics in this grouping are unimportant, we’re surprised to see “Culture and Tone at the Top” and “Compensation Matters” listed in the top three priorities of 9% and 12% of bank boards, respectively. “Culture and Tone at the Top”, “Compensation Matters”, and “Political Contributions” seem like they’re only worth prioritizing once the board has addressed the topics that might affect their short-term longevity. If your bank board plans to prioritize any of these topics in the coming year (above topics such as “Strategy”, or “Risk Oversight”) we’d love to hear your reasoning. The more we learn about how your board determines its priorities, the better we’re able to develop our board software around meeting your needs! “CEO Succession Planning” should receive prioritization on par with “Risk Oversight”. In some ways, it’s a form of crisis preparedness. The second your bank loses or knows it will lose its CEO, the board must act quickly to secure a successor. There’s not much worth noting about the prioritization of “Shareholder Activism” and “Shareholder Engagement”. “Shareholder Activism” was removed as an option in the 2016 survey. Regardless of this change, there was only a 3% change in prioritization between surveys. “Mergers and Acquisitions” was only provided as an option in the 2016 survey, but it was listed in the top three priorities for a staggering 18% of board members. There’s not much commentary we can offer on the 18% without having data for comparison. However, we can assume that at least a fraction of the 6% listed as “Other” in 2014 relates to M&A. Even with a 14% decrease from 2014 to 2016, the magnitude to which bank boards prioritize “Strategy” is worth noting. This tells us that bank boards value planning and decision-making. We feel confident in saying that effective planning and decision-making is informed planning and decision-making. In theory, the more information a board has at its disposal, the more of an opportunity they have to make the best possible decisions. In practice, board members can easily feel overwhelmed by the amount of data available to them. Organizing and navigating information becomes vitally important. Simply “condensing” or summarizing data creates the possibility of overlooking key risk factors that might otherwise affect the outcome of a board’s decisions. Board software allows bank directors to efficiently evaluate information and, ultimately, make more effective, informed decisions. 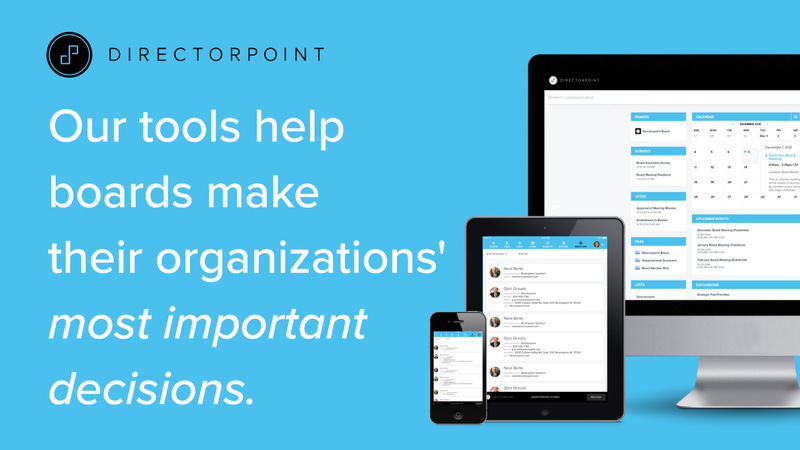 Check out the Directorpoint blog to learn more about how board software can benefit your board. The results of this topic grouping are fascinating. In 2014, none of the board members surveyed within the financial services industry listed “Board Orientation and Training” or “Board Evaluations” in their top three priorities. Only 2% listed “Board Committee Structures and Roles” and “Board Leadership”. In 2016, five of the six categories in this grouping increased in their selection as a top three priority. The increased prioritization of “Board Orientation and Training”, “Board Committee Structures and Roles”, and “Board Meetings and Materials” are, individually, unremarkable. Combined, they suggest an increased emphasis on board affairs. The real eye-catching results of our comparison come from the increase in prioritization of “Board Evaluations” and “Board Leadership”. In 2014, no one listed “Board Evaluations” in their top three priorities. Just two years later, it was listed in the top three priorities of 9% of boards within the financial services industry. This shows an a heightened awareness and increased emphasis on self-improvement. This emphasis is further supported by the 7% increase in prioritization of “Board Leadership”. We can’t ignore the decrease in “Board Selection, Recruitment, and Composition”, but it’s quite possible that bank boards acted on this priority between 2014 and 2016. It was in the top three priorities of 37% bank boards in 2014. In 2016, it was prioritized by fewer bank directors while topics which emphasize building a stronger, more effective board were prioritized by more directors. The success of a bank relies heavily on the decisions of its board. Based the reallocation of priorities between 2014 and 2016, it’s increasingly clear that bank boards are starting to realize the impact that the effectiveness of their decision-making can have. An effective board needs effective tools. If you’re interested in learning how Directorpoint is helping banks make better decisions across the board, schedule your free demo of our easy-to-use board software today. We hope our deep dive on Deloitte’s Board Best Practices Report has left you with some food for thought. You can find more insights on board governance and decision-making on the Directorpoint blog. To speak with a board software specialist, you can contact us online anytime or call (888) 492-7020. Methodology Note: In both the 2014 and 2016 reports, percentages were “based on the number of respondents to each question” (Deloitte, 2014). These percentages may not, in some cases, add up to 100% due to rounding. Posted in Blog and tagged Bank Boards, Banking, Banks, Best Practices.